The music of a country reflects its mood, history, and dreams. Israeli popular music, in particular, has tapped deep into the soul of our people. Israeli music sings of wars, immigration, terrorism, kibbutz life, love, children and, of course, endless dreams of peace. Israel’s popular music has helped us get through the worst times and helps us celebrate our best times. As much as we connect with the music the music connects all of us. We have a common destiny and, together, the music helps take us there. When I was faced with the challenge of choosing Israeli singers and their CD’s, I didn’t think I could do it. How do you pick from so many successful singers and bands. How can I decide which ones are the best? I decided to enlist the help of my 20-something Israeli friends, many of whom live on kibbutzim, or in the cities, and even on the many army bases throughout the land of Israel. We sat down together to determine which songs and songwriters best reflect the popular Israeli music scene. We not only came up with the artists we loved best, but also many of their collections that have made the biggest impact on our lives in Israel during the last 10 to 15 years. The Israeli artists we will tell you about also reflect a spectrum of taste and sound. Many have been around since the early 1960’s and many, or course, are recent additions to Israeli pop culture. 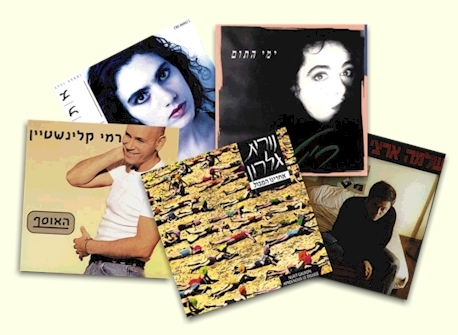 So, here goes, what I, and my friends consider: The Essential List of Israeli Popular Music. “WILD FLOWER,” by Chava Albertsein is a timeless classic in Israel. The songs on “Wild Flower,” were written or inspired by the famous Israeli Poet, Rachel Shapira. This album is nice and quiet. Good for relaxing with your friends over coffee and conversation. Albertsein was in the height of popularity 20 years ago. She has a wonderful voice and her melodies are very soft and pleasant. She has written at least 40 records herself; a pretty amazing accomplishment, but lately, the only things she publishes are CD collections and a new CD all in Yiddish. “LOVE YOU MORE,” by Riki Gal. On this CD, you’ll find “Beattle”-style rock songs along with quiet love songs. Gal was raised in a convent in Haifa after being left there by her mother. Many of her songs are written with her mother in mind and are often sad and even a little heart breaking. I don’t consider her work an everyday listen, but when you’re in the mood to reflect Gal is it. “AFTER US,THE FLOOD,” by Nurit Galron. This is a great CD. Especially the title song, “After us, the Flood.” This song talks about getting out of the occupied territories. It is part of a very powerful collection.Galron got her start in an Israeli army troupe band. Her songs are generally more targeted toward adults than teenagers. “YEHUDIT RAVITZ,” by Yehudit Ravitz.. All of Ravitz’s albums have been huge hits in Israel. Her music fits all ages and all music styles. She is known for her sweet children’s songs to her beautiful love songs. Every song on this album is a winner. Upbeat, sweet, pure Israel. “MAZI COHEN,” by Mazi Cohen. Mazi writes mostly rock songs. A bit underrated on the Israeli music scene, Cohen has a wonderful and special voice. She has starred in many rock operas, but her songs address a narrow audience and she has not received the kind of acclaim she deserves. “I SEE YOUR EYES,” by Etti Ankri. Her first and best CD. The best song is “I see it in your eyes,” which is about a woman who leaves her man because he isn’t letting her be herself. Ankiri combines many ethnic elements in her songs. She has a beautiful voice, but only one good record. “DAYS OF INNOCENCE,” by Rita. The best love songs in Israel today. You won’t go wrong with this album. Rita is the most successful singer in Israel today. She burst onto the Israeli music scene in the early 1980s and hasn’t slowed down. Her voice is very powerful and theatrical. In fact, a while back, Rita stared in Israel’s Hebrew version of My Fair Lady. “SEEDS OF SUMMER,” by Meir Ariel. His songs take a little extra time to get used to. They tend to be more theatrical and run extra long. However, they are worth the try. Ariel passed away suddenly in July 1999. He was 60 years old. Ariel was born on a kibbutz and was very popular with listeners over 25. He was known to write all the words for his songs as well as other singers. If you like a theatrical style including humor, you will enjoy the music of Meir Ariel. “TIP TIPA,” by Ehud Banai. This CD has an oriental feel to it. When you hear the song, “Tip Tipa,” you will actually feel as if you are riding the camel in the lyrics. Absolutely wonderful. Banai combines ethnic, oriental and rock elements in his songs. His music is extremely colorful and diverse. “SHEBA,” by Shlomo Gronich. Gronich took a group of Ethiopian kids and wrote wonderful songs for them, especially the song titled, “Mooh,” which tells the story of their journey from Ethiopia to Israel in the mid 1980’s. “JULY -AUGUST HEAT,” by Shlomo Artzi. This album consists of many powerful songs. The title song is about the outbreak of war. Artzi has been a record- breaking singer for the last three decades. He began his career as a singer in an army troupe and his popularity took off. He reminds me of a cross between Bruce Springstein and Billy Joel. A great sing-along CD. “ELEMENTS OF LOVE;” “1st COLLECTION;” “STOLEN KISS,” By David Broza. David’s songs are sweet and very easy to listen to. You will fall in love with his beautiful voice and guitar playing. Broza has been in the business for more than 20 years. His songs are now classics in Israel even though many of his listeners weren’t even born yet. A few years ago, Broza declared bankruptcy and left Israel for the United States. He comes back to Israel every two or three years for live concerts, which are always sold out. He is a great guitar player and has a strong Spanish influence in his music. “ASHES AND DUST,” “HURTS BUT LESS,” YOUR BLUE EYES,” by Yehuda Poliker. Beautiful, heart breaking, sad songs. “Dust and Ashes,” is about the Holocaust. Very poignant. Poliker is also known in Israel as the “sad singer.” He has happy songs, but they aren’t as good as his sad ones. His parents survived the holocaust and his best friend died in a war when he was only 20 years old. Every year, on the memorial days for the War of Independence and for the Holocaust, Poliker is the artist played the most on the TV and radio. “THIS TIME AROUND”, “A MAN FROM WITHIN,” “CAN’T SLEEP,” “WAITING FOR MASHIACH,” by Shalom Hanoch. You can’t go wrong with any of these CD’s. They are practically classics. I see Hanoch as the Bob Dylan of Israel. He is simply the best. His older songs are much better than the new ones. They manage to touch you deep inside, and that’s about the best compliment you can make about any singer/songwriter. “RADIO BLA BLA,” by HaChaverim Shel Natasha. This is one of the best CD’s ever made in Israel. It tells the story of a radio DJ who has four different personalities and each one of them has different songs, from quiet ones to loud, techno songs. HaChaverim Shel Natasha is one of the most successful bands in Israel for the last ten years. Unfortunately, they broke up three years ago. Their songs have great beat and rhythms. I highly recommend their music for the young and young at heart. Arik Einstein: Just sit back and relax to the music of this man. All his songs are wonderful and real classics. He used to be a famous athlete and actor. A few years ago, he had a car accident and since then, has stopped performing. Matti Caspi: A great musician, some even describe him as a musical genius. His style is very humorous and sweet. He’s written some great children’s songs as well as love songs. My favorite Caspi songs are his Brazilian ones. He has written many songs in Hebrew with a South American beat. Sheva: This is a band consisting of seven members. They take most of their lyrics from the bible and set it to music. The band lives close together in the Northern Galil. They are famous for the special instruments from India that they play as well as the ones they make themselves. Their songs express their hope for peace and harmony among nation. In this spirit, their band has members that are Arab and Israeli Jews. Boaz Sharabi: Probably the best Sephardic singer in Israel – ever. Start with the collection of his greatest hits. Then try his individual albums. Eviator Banai: He combines sweet and cheerful songs with sad and touching songs. My friends and I can listen to him for hours. Rami Kleinstein: A very successful singer for many years. He writes his own music and words for himself and many other Israeli singers, including his famous wife, Rita. Most of his songs are very romantic, and he looks great. You just can’t ask for more. Zohar Argov: Another king of Sephardic music. He was big in the 1970’s and 1980’s. However, during the late 1980’s, he was arrested for drug possession and later committed suicide in prison. Gaia: I haven’t heard all of their songs yet, but the ones I’ve heard, are full of happiness and optimism. Tipex: A band from S’derot, a small town in the Negev. They are one of the best. All their songs are funny and happy and usually become a huge hit the minute they go on the air. Todah for this list. I have fallen in love with Israeli music. I know many of the wonderful artists you have mentioned and I am very excited to discover some more. One of my favourites that isnt on you list is The Idan Raichel Project. Thanks all the way from Australia.